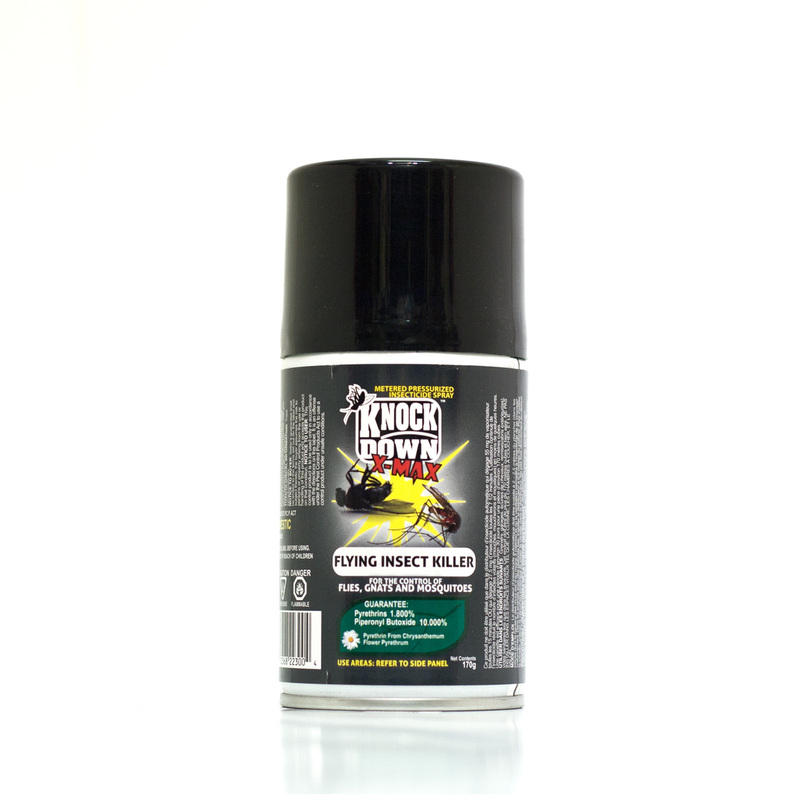 KD300D – KNOCK DOWN – X-MAX FLYING INSECT KILLER -CSA – KUUS Inc. Designed to use a wide range of automatic metered CSA style dispensers. 177 g can contains enough product to protect an area up to 170 m3 (6,000 cubic feet) of free flow air space, for up to 30 days. 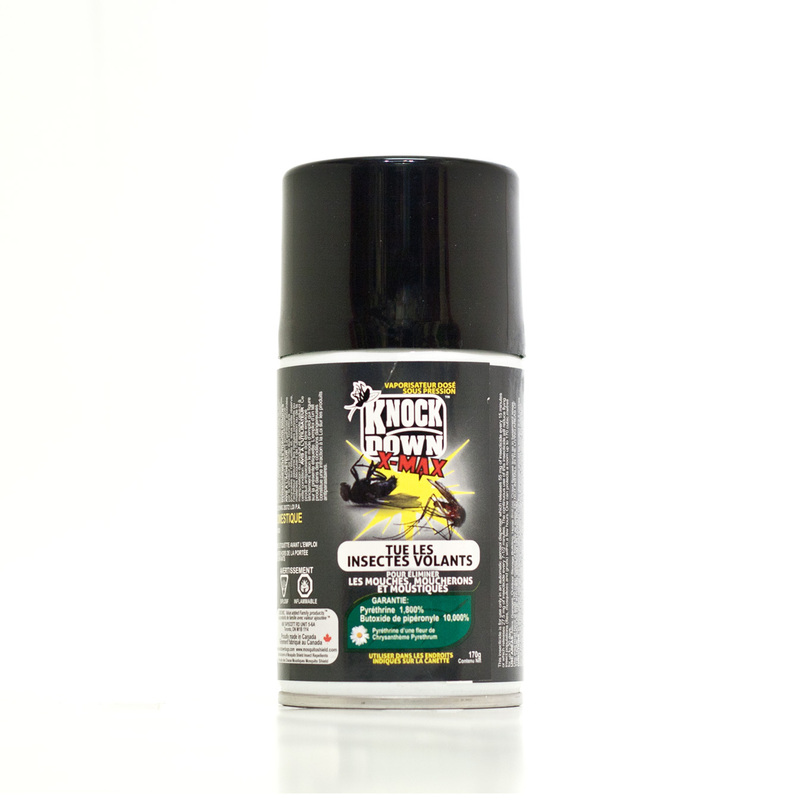 This insecticide is for use only in an automatic aerosol dispenser which releases 55 mg of insecticide every 15 minutes or which releases 27.5 mg of insecticide every 7-1/2 minutes. The continuous use of this insecticide will reduce flying insect populations (flies, mosquitoes and gnats) within a few hours. USE AREAS: Attics, Garages, Outdoor Storage Building, Horse Stables, Crawl Spaces such as in basement areas. Use area must have at least 170 cubic metres of free flow air space. DO NOT INSTALL IN THE LIVING AREAS OF THE HOME SUCH AS THE KITCHEN, BEDROOM OR LIVING ROOM. DIRECTIONS FOR USE: In areas where ceilings are approximately 3 metres high the dispenser should be located 2-2.5 metres above the floor at a point where air circulation will carry particles throughout the area. In areas where the ceiling are low, such as attics and crawl spaces, install the dispenser approximately 0.5 metres from the ceiling. To install can, remove protective cap and screw into dispenser. Do not install directly over food or food packaging surfaces.